"Shake Him Real Hard, Maybe He'll Disappear." Dan and I scored at an estate sale yesterday. 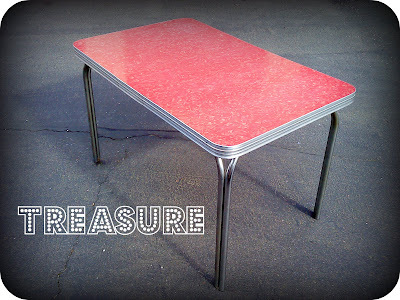 We bought Grandma Steinbeck's Formica table for ten dollars. We already own two Formica tables but I couldn't leave this one behind. We also found lots of treasure for our shop. I'm planning on sharing it with you as soon as I'm feeling better. But for now, I have shoppers high about our new table. my grandmother grace had one just like that in her kitchen. That table looks like it's in perfect shape. I can definitely see why you like it. I forgot to say I like it too! Fun for you guys! love love love! my grandmother had a white one just like it. you have the best eye and the best luck when it comes to treasure hunting. so so jealous. feel better soon. happy saturday wishes. wow wow wow, that table is perfect.